I’ve always loved a challenge. My normal challenges usually include walking and climbing mountains. I’ve never really been a runner, I found walking more relaxing, and a little easier on the body. I viewed running as a quick way of exercising the dogs before work in the mornings. A six mile run was about my limit. I occasionally ran the ridges once I had climbed a mountain to cover more distance in a day. This helped during the winter, when days were shorter and there were no views to soak in. But I definitely preferred walking. In December of 2017, my 40th birthday looming, I wanted to do something significant to celebrate it and I wanted it to relate to my favourite pass time, the great outdoors. I also wanted to raise money for Mountain Rescue, after a fire had destroyed their head quarters and they lost vehicles and life saving equipment. Walking wasn’t really a challenge as I did this all the time and covered miles on a day out in the mountains. I had already climbed the highest peaks in Wales, England, and Scotland and completed the three peaks. I wanted to keep the challenge local and centred on the Brecon Beacons to relate to the mountain rescue, also being one of my favourite areas. 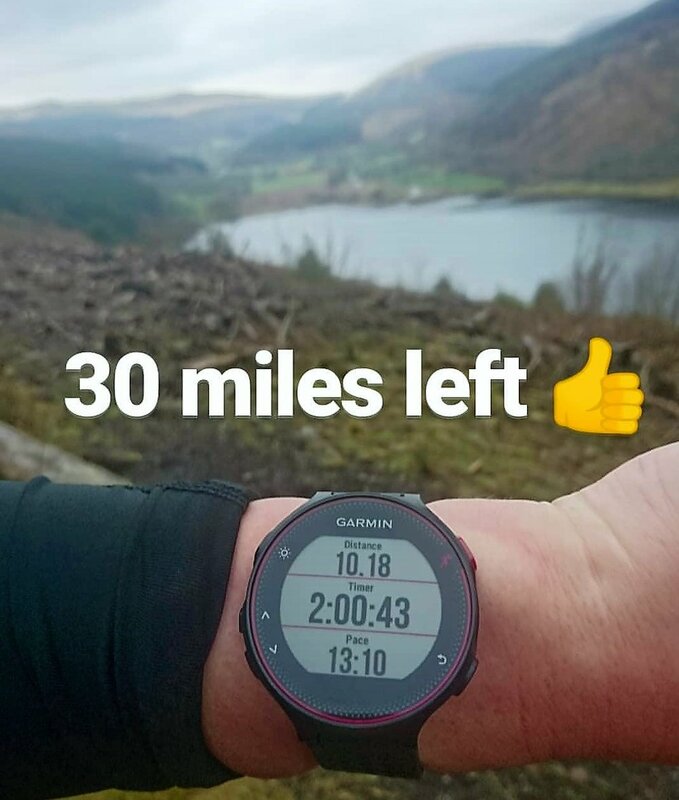 So yes, I decided to run 40 miles, 40 miles for 40 years and run through the Central Beacons. The Taff Trail, a long distance foot path and cycle route started in Brecon and travelled south through central beacons, down to my home town of Mountain Ash. This route would be perfect and as luck would have it was exactly 40 miles from Brecon to Mountain Ash. My Birthday is the start of February and thought the weather may not be so good to complete it then, especially if people wanted to join me, also it did not give me much time to train. So I set a date for 24th March and after the Christmas period, uploaded all the details to my social media accounts, set up a JustGiving page and I was now committed. Once I started researching training plans I realised 14 weeks wasn’t enough time to sensibly train for a 40 mile run. Especially as I had only ever run 6 miles without walking, but I knew I had a good fitness level from spending hours walking the mountains every week. The only problem would be a knee injury which reoccurs now and again. The first long run I completed was Boxing Day. I got a few odd looks and comments from people out on a relaxing post Christmas stroll as I ran by. I ran part of the route that I had planned for the 40 mile run. Seven miles into the run my knee really started giving me problems. I turned back for home and managed 12 miles that day. I started to complete regular shorter 5 or 6 mile runs to try and build up slowly. Mid January I managed to get a distance of 14 miles, with added elevation to challenge myself that bit more. Knee still wasn’t great, but it was just uncomfortable not painful. Towards the end of January I wanted to get over 20 miles and again chose a hilly route. I finished the last three miles with a fast walk as I was in agony with my knee and hip. Plenty of post run icing, lots of massage and yoga sessions over the days that followed and back to my regular shorter 5 mile runs. I also realised I wasn’t stretching enough before my runs, I put together a recommended stretching routine that I had found on the internet and it made a huge difference. Early February I ran 24 miles with a good pace. The route was flat so I knew it was the hills that were affecting my knee. From then on I would run a 20 plus mile route every week, usually my long Runday Mondays. I would then continue with my shorter 5 mile runs through the week and of course my mountain hikes at the weekend. My time was improving and the pain was much less, although I wasn’t really concerned about the time, I just wanted to run distance without pain, however it was a good way to gauge that I was improving. Nutrition was also something I needed to research and address. I eat a moderately healthy diet, however running all these training miles and burning crazy amounts of calories I needed to fuel my body correctly. The long run days were hard, as I didn’t want to eat during my run, but knew I had to replenish my carbs and salts. I would take Jaffa cakes and jelly sweets with me and eat some between 10 and 12 miles. I was still feeling a little fatigued at 20 miles and knew these really weren’t the healthy option. A friend was using a product called tailwind. It’s a natural power form that adds to your water. I did a little research and it alleged that it was all I needed, that it contained all the calories and electrolytes I needed to consume on a run. Two scoops to 500ml water and sip 500ml of water throughout every hour of my run. It certainly worked for me. It stopped the muscle fatigue and gave me a lot more energy. I also took bananas on my long runs and started eating one or two at 12 to 15 miles. Eight days before the big day I did my last long run. I ran a shorter distance than previous long runs as I wanted to start tapering down. I ran 14 miles in a moderately good time and I felt confident with no discomfort during the run. My last run was two days before, a quick 5 miles and the nerves really started to kick in. Two nights of not great sleep thinking of all the things that could go wrong and then the big day was finally here! Early morning 5.30am alarm. No snooze button pressed today! I was up and out of bed feeling nervous, but excited. I had laid everything out the night before, so shower and dressed for breakfast of porridge and berries at 6am. Wanted to eat exactly 2 hours before the start of the run which I had read somewhere on the internet was the ideal gap to leave before starting off. I arrived at the car park in Brecon just before 8am where Colin a friend of mine was waiting. He offered to be my photographer for the day (and an awesome job he did too!). Mark (who was completing the whole of the run with me) was still yet to arrive. I got on with some stretching and warming up, and mark soon arrived with his dad, who would be supporting us for the first 20 miles with water and supplies at various points. Some quick photographs taken by Colin, synchronised our watches and off we went! The weather had forecast showers, which I didn’t mind as previous weekends we had snow, which was enough to close roads and cause disruption. No rain as yet though, a little over cast but dry and perfect running temperature. The first section of the run is canal tow path for 7 miles, which was great as a nice easy flat run to get warmed up. It was very quiet, no one around just some ducks taking an early morning swim on the canal. I hadn’t ran far when I realised I hadn’t updated social media, so quick stop at a field as we passed to have a selfie with some hungry sheep. The tow path was really muddy in places and jumping over boggy sections to avoid getting wet feet early into the run did not help my knee problem. I did take a slip at one point, but did manage to save myself before sliding into the mud. As we ran into Talybont on Usk we were seven miles down and completed the first section. The weather started to brighten up and even a few glimpses of blue sky. Colin was snapping away with his camera as we reach the bridge and Roy (Marks dad) waiting with the supplies. Coat off and it was on to the next section, the dreaded Brinore Tramroad and relentless forestry climb alongside Talybont Reaservoir. This section although the most picturesque and has fantastic views, it’s the one section I had been dreading. It’s pretty much uphill for roughly 6 miles. My knee hadn’t coped to well with this section in training and although I had said I may walk most of this section, we ran it all the way. We took a few quick stops to stretch and some Garmin snaps to update everyone. We were nearing the top of the forestry road, this is the steepest part. At this point my groin also started to hurt, I slowed my pace down to a fast walk and at that moment Colin came into view as we took the corner snapping away with his camera. That soon made me pick my pace up, didn’t want to be seen slowing down this early. Another quick stop to stretch out the muscles and refill water, then we headed down towards Torpantau station along the road to complete section two. The steep downward run to the station was a bit uncomfortable, I was aware I was running extremely strange. I started to worry a little as I was only 14 miles into the run and there were a lot more downhill sections to go. As we passed the train station and left the road the trail flattened again. The flat trail was a welcome break, although quite muddy I could cope with that, was just relived to be on the flat again. There were very few people out walking in the area for a Saturday morning considering the weather was nice. A few sheep looked on as we passed, I couldn’t resist a photo with the black sheep. I started to feel hungry at this point. Ate a banana and half a fudge brownie energy bar and remembered as we left the muddy track and turned onto the road it drops sharply down hill again. I hoped the pain in my groin and knee wasn’t as bad this time. The flat run must have helped rest it as although felt uncomfortable the pain wasn’t as bad, this gave me confidence again and seeing Colin waiting at the stone humped bridge I knew we would now be running the road for a mile and half. Fortunately it was a quiet day and there were few cars passing, there is no pavement and it is a single track road with huge amounts of mud and water to run through should we have needed to keep in to let cars pass. It was still quite overcast, but not at all cold. 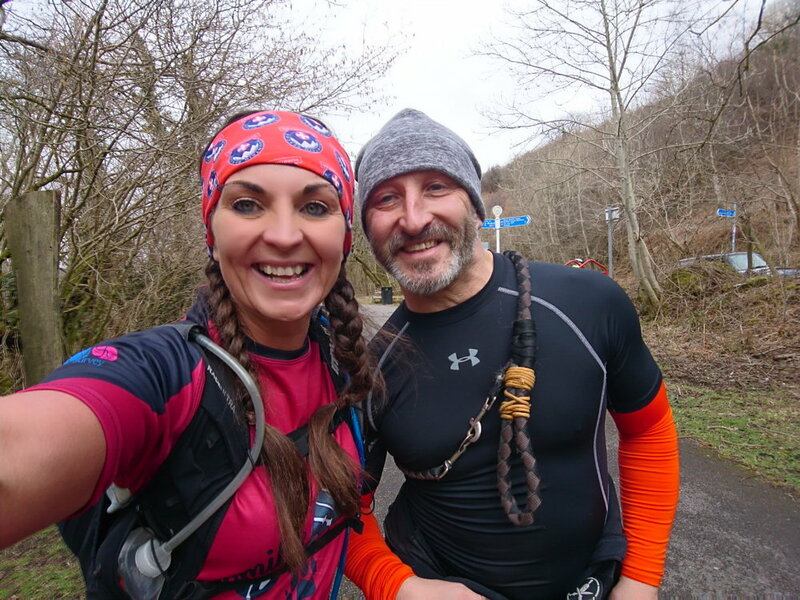 We started chatting about the miles we had covered and I started to realise that Marks watch was reading more distance than mine and the gap between our distances were becoming greater the further we ran. We were trying to figure out why this was the case. It did start to concern me slightly. It was only under a mile difference at this point, but over the next 24 miles could be a huge difference. The road follows the bank of Pentwyn Reservoir, everything seemed so still and eerie. It was 12.20 but felt really early in the morning, time had passed by so quickly. We had roughly 4 miles left until halfway point, which was the Red Cow pub in Pontsticill. There were people meeting us there and I had told them we would be arriving around lunch time. So I tried to pick up the pace a little, 4 miles in 40 minutes should be fine, although we still had two hills to climb. Another social media update, a quick selfie with an on looking horse and we were leaving the road for the forestry track which eventually would lead us down into Pontsticill. We left the road and turned right onto the forestry track, we slowed down to a fast walk to climb the hill and also to rifle through my bag to find that last piece of fudge brownie energy bar. I was starting to feel hungry and was looking forward to a few slices of pizza I had set my mind on when we reached half way point. This forestry section has a few ups and down, twists and turns. There are fantastic views at the top of the hill, looking down on Pontsticill reservoir. I just kept thinking how great the weather was for the run. I’m sure Mark got sick of hearing me say that! On reaching the top of the hill we started running again, down to a really cool bridge that passes over a canyon, quick stop for a photo and then the final track down to the road to get to the half way point. I was really looking forward to seeing some familiar faces at the red cow and to rest my right knee and hip for a few minutes. We reached the Red Cow pub just before 1pm, I was really happy with our time for the first half of the run. 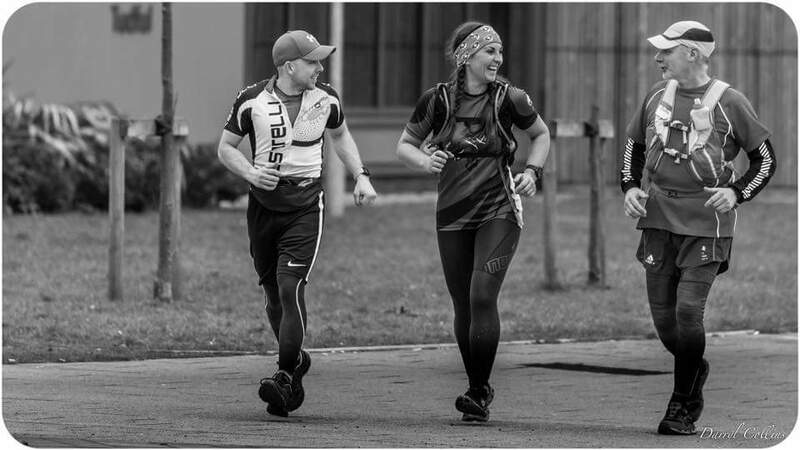 It was lovely to take a break and know we were half way through, I couldn’t stop smiling even though the knee and hip were painful, seeing friends waiting for us and then joining for the next few miles was great! A quick bite to eat and some photos, we were on our way again. Marks Dad Roy was now joining us on his bike. He kept joking about us jumping on the bike and at some points really felt like doing just that! Colin was at Pontsticill Reserver Dam wall taking more photos, I stopped to refill my water and then had a lovely surprise to see more friends waiting to run with us. Their company really meant a lot and for the next 4 miles as we ran along the Taff Trail time just flew by. I can’t even remember passing certain places and I had certainly forgotten about the discomfort my right leg was giving me, we passed over Pontsarn viaduct were Colin was perched taking shots again. We had Bear my friends dog join us and I missed Asher for a while, but I knew if I had him with me he would have caused more problems by pulling me around in all the excitement. As we ran across the second viaduct in Cefn Coed y Cymmer, Huw ( who is a long standing member of the mountain rescue team) updated social media on our progress through facebook live and then told me members of mountain rescue would be waiting in Merthyr as we passed by the college car park to cheer us on. As we ran through the car park the cheers of encouragement by the team were fantastic! Huw sadly had to leave us at this point, he was running a half marathon the next day. I was so grateful for him joining us for the 6 miles and for arranging the team to meet us on route, it made such a difference to those hard miles after the half way point. We were now back down to me, Mark and Roy on his bike. The three of us were chatting away and all I could think of were Cadbury mini eggs which I had left in my van at the end of stage 4. I had left my van in the car park at Merthyr Leisure Park that morning before making my way to Brecon, to use as an aid station to refill water and supplies if we needed them. I suddenly realised it was only around the corner and couldn’t believe how far we come already. The mountain rescue team and friends who had joined in for a while certainly helped whittle down those miles. The start of the next section, which I had made stage 5, was the longest section at nearly 9 miles. It didn’t have any views and was flat for most of the route. Where there was incline it was short. I had run this route many times in training, however it was marks first time to run this area. We started stopping to stretch more frequent throughout this section, it was really starting to tell on the legs. The distance difference between mine and Marks watch was now a mile. I realised that my watch was on auto pause, so every time I was stopping, the watch would stop, but wasn’t starting immediately when I would start running again, causing me to lose distance. We still had 14 miles left and I had to try and make up the mile somewhere. Most of this section is a footpath that runs alongside the busy dual carriage way of the A470. Because the trail is much lower than the road it is quiet and runs along the backs of small villages. We started to see more people out walking as time went on and even two horse riders passing by, so glad I didn’t have Asher with me this time, don’t think I would have had the strength to hold him back. Passing by Abercanaid, just before we reached Aberfan a friend stopped alongside us on his bike. He had ridden up the Taff Trail from Cardiff with some friends. This has to be at least 25 mile journey, that’s without travelling back to Cardiff. I really appreciated him taking the time to show his support, it made such a difference seeing friends along the way, helped us to dig deep and push on. The next friendly face and surprise visit was at Pontygwaith bridge (a humpbacked bridge that was used to run the first ever steam locomotive in 1804). It is so steep I can’t imagine how a train ever ran over the top of it! The friendly face was hidden behind a camera, it was our local town photographer Wayne. Wayne followed us for the last 7 miles, meeting us where he could with his car taking photographs and filming us for Facebook live, to update everyone on our progress. This helped so much as I needed something to take my mind off the discomfort again. Colin was also still snapping away with the camera as we were leaving the trail and crossing the roads. More friends were waiting at the end of this section and all the support over the last few miles was certainly where I needed it the most. We reached Abercynon and only 4 miles left. We checked each other’s watches and I was now a mile and a half down. The last 2 and a half miles is a regular running route of mine and there were two places I knew I could add on the extra mile and a half. I left Mark to stretch and ran up towards the main road and back but still not enough. I had just over a mile to make up. We were near to hitting the 40 miles and a friend was up ahead on the trail shouting and cheering, another friend standing on the footbridge above the path cheering. It really helped to push us on, but I was concerned about this extra mile I had to run before reaching the end point. Marks watch beeped and he shouted, we’ve done it! 40 miles! We high fived and I laughed knowing I still had to do more to get my watch to 40 miles. There was an opening up ahead onto the industrial estate. I left Mark to stretch and ran a few laps around the estate. Hoping it would be enough, I rejoined Mark and we ran onto the finish point. As we ran alongside the river and over the bridge into the street the welcome from friends was fantastic! But it wasn’t over yet! I had to shout I cant stop, my watch hasn’t done 40 miles and I had to run straight past everyone. I ran to the bottom of the street, turned around and just as I reached them again the watch hit 40 miles! Thanks to everyone’s kind donations we raised £3,153.50 for Central Beacons Mountain Rescue Team. To all those who donated, thank you so much for your generosity. And to all those who came out on the day to support me I can’t thank you enough. It made such a difference having you there cheering us on. I enjoyed every minute, was indeed painful but awesome!